95 in stock Need More ? In recent years, our knowledge of what goes on in our Ocean has been transformed. Blue Planet II uses cutting-edge breakthroughs in science and technology to explore new worlds, reveals astonishing creatures and extraordinary new animal behaviours. As we journey through our deep seas, coral reefs, open ocean, green seas and coasts we share these extraordinary new discoveries. But we now know that ocean health is under threat. Never has there been a more crucial time to explore our remotest seas, and to examine what the future will hold for our blue planet. Narrated by David Attenborough. 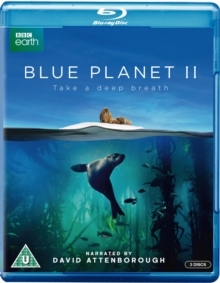 Episodes: Episode 1 - One Ocean, Episode 2 - The Deep, Episode 3 - Coral Reefs, Episode 4 - Big Blue, Episode 5 - Green Seas, Episode 6 - Coasts, Episode 7 - Our Blue Planet.